1652 SHILNG Pine Tree Shilling, Large Planchet, No Pellets at Trunk, MS65 PCGS. CAC. Crosby 7-B3, Noe-7, W-730, High R.6. Ex: Ford-Manley. No Pellets. 71.4 grains (per Ford catalog). Plated in Wurtzbach. The Pine Tree shilling can rightly be called the quintessential Colonial coin. It is well known even outside the realm of numismatics, and its image is ubiquitous in texts about the Massachusetts Bay colony. While not rare, Pine Tree shillings have a romantic quality that has enticed countless collectors. If a collector were to choose only one Colonial coin to own, it would undoubtedly be the Pine Tree shilling. It is remarkable that this piece has survived for well over 300 years at the Gem level of preservation. It certainly makes one wonder how that is even possible. Perhaps a collector, in the same vein as Lord St. Oswald and his spectacular 1794 coins, saved this specimen from the moment it was struck. Thousands of Pine Tree shillings have survived to the present day, but this piece ranks above virtually all of them. Michael Hodder (2005) writes that only 11 examples of the Noe 7 Pine Tree shilling are known. This was the only use of this obverse, which has the tree centered directly over the M in MASATHVSETS. A die crack bisects the reverse but does not obscure any of the letters or numerals. The present coin is a magnificent Gem Uncirculated example of this very rare variety. The Pine Tree series is believed to have been struck between 1667 and 1682, although the exact date of its inception is unknown, and it is likely that there was a gradual transition from oak to pine styles. Two major types of Pine Tree shillings were struck: the first on large planchets and the second on small planchets. The Large Planchet shillings were struck using the antiquated rocker press, but the introduction of a screw press circa 1675 marked the beginning of the Small Planchet type. While both types are desirable, the Large Planchet pieces are especially popular. Gunmetal-gray patina with subtle hazel accents cover the obverse of this specimen. The periphery of the reverse is light silver-gray, while the center has a pleasing bluish tint. The planchet is nearly round and virtually all of the letters are boldly struck. Only the VS in MASATHVSETS is not fully defined as a result of the rocker press. The tree is exceptionally sharp with no areas of weakness. Carl Wurtzbach, who once owned this specimen, described it succinctly: "Gem Coin. Cannot Be Excelled." We feel that his description accurately represents this stellar coin. 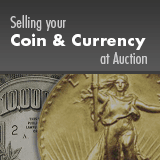 Consign to the 2019 August 13 - 19 ANA World's Fair of Money World Coins Signature Auction - Chicago.